I did know immediately that I wanted to see it because I thought the bit in the trailer with Chris Pratt (“Star-Lord”) getting caught stealing an artifact was hilarious (“Star-Lord?” Who?”). I went into Guardians of the Galaxy expecting to be entertained, and I was. This movie is perfect for a date, a night out with friends or family time (and don’t forget the popcorn). 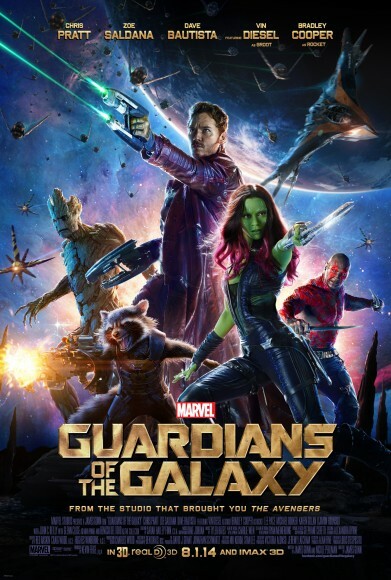 Guardians of the Galaxy is probably my favourite Marvel film to date. I would happily see this a second time in theatres. Chris Pratt’s character (Peter Quill, who is only sometimes known as Star-Lord, to his dismay) starts off as an intergalactic scavenger and thief who manages to become the target of a manhunt after stealing a mysterious orb wanted by some Seriously Bad Dudes™. He then escapes prison with his four companions, who include a sentient tree, a genius raccoon, a green assassin and a giant bent on revenge. Yes, as you can tell, this Marvel series doesn’t take itself quite as seriously as some others, which I loved. This is the funniest of the Marvel movies to date, with a ton of great jokes, including references to Kevin Bacon and classic (or perhaps clichéd, but still great) 70s and 80s music. Should you go see it? Yes – maybe I’ll see you there! Have you seen it? Let me know your thoughts in the comments!